Would YOU accept the signature of a traitor? One gives new meaning to "Stinky Pete"
On another note, Joey over at Squeezeplay Cards is showing off his sports collectible Christmas Tree! And the first ornament he shows us is a Cleveland Indians Jersey! It is very, VERY cool! Hi. Here's a confession. 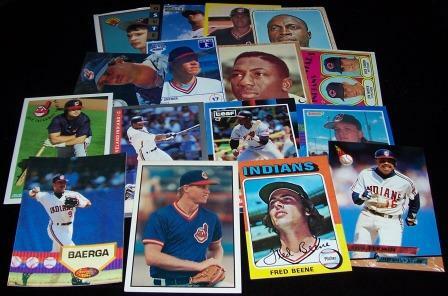 I'm female and my daughter and I both collect baseball cards. Strange but true. We'd like to send you a bunch of our spare Indians cards. My email is salsa_van AT yahoo dot com. Send us your post office box number or whatever. Wow, I have no clue what's coming... I'm looking forward to this! More gift packs are shipping out Friday! The Holiday Season and 78 Cards?